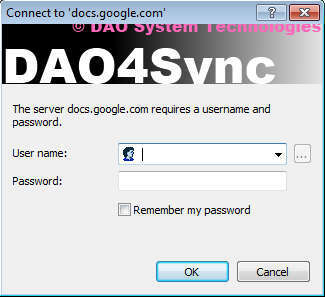 DAO4Sync Docs Edition is a free application which is gonna create a virtual drive for Google Docs, so that they can be accessed seamlessly when you’re using your PC, just like you would any other location on your system. This free Google Drive desktop client only works on Vista, Windows 7 and 8, so all those who are using older versions of Windows are either gonna have to upgrade or look for alternatives. What you see on the image above is Windows Explorer with our Google Docs files opened within it. In the background you can see a Google Docs account and as we are creating documents on our computer, they are also being simultaneously updated and showed on our Google Docs account online. DAO4Sync isn’t very difficult to use, and the application isn’t very large, very small amount of computer resources is necessary for it to work. Similar software: inSync, Joukuu, Gspace. A lot of people are using Google Docs where they have easy access and editing of important documents, spreadsheets and presentations available. With Google Docs, it doesn’t matter where you are in the world, to access important files all that you need is an internet connection. Not only that you can access your files, but you can also edit them, which makes Google Docs even more useful. However sometimes, for some reason like additional editing functions, users would like to open their online documents locally in Office or its free alternatives LibreOffice or OpenOffice. Normally in these types of situations you’d have to export your files from Google Docs, save them to your computer and then open with the program of your choosing, but now with DAO4Sync Docs Edition you can open and edit them directly online. This would be the main configuration window of DAO4Sync, and this is where you’ll be making the majority of changes. 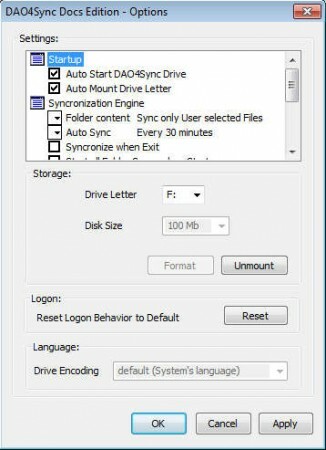 Most important thing that you need to do here would be selecting the drive letter if you haven’t when you started DAO4Sync for the first time. After that you’re gonna see an additional partition when you open up My Computer, like you can see on the image above, this means that you can right click on the tray icon again and then on Logon, to enter your Google account login details, so that your files will become visible inside that virtual drive. DAO4Sync Docs Edition really does as advertised, it’s gonna create a virtual partition where documents from your Google Docs account can be accessed, viewed and edited, without having to open Google Docs in a web browser. Setup is very easy, just two steps are needed, and you’re gonna end up with a Google Docs client on your PC.